Sewing takes time and is not easy. I now have a new found respect for all the Halloween costumes, pajamas, hemmed pants, and anything else my mom and aunt have made for me over the years. LESSON #2: It’s a Conspiracy! “The grain? What are you talking about? The pattern said..,” I started to respond while being cut off. “Never read the pattern. We’ll teach you better. The pattern is always wrong,” she’d say. Every time I read the pattern in class, I was told I was doing it incorrectly. And every time I didn’t read the pattern, she’d point to the directions on the pattern and tell me I did it wrong. I think my teacher is part of the conspiracy mentioned in lesson #1. Did they not realize? Did they not notice that I was a dude, in a sewing class, making dresses, for my daughter? While their husbands were at home sitting on the couch drinking beer and yelling at the TV, I was learning how to hem a skirt and sew on pockets. Something tells me we were in different categories. All the fabric stores, sewing equipment and sewing accessories are all marketed towards women. I wanted to buy a pin cushion but they were all cute little baskets with flowers or pink tomatoes. I just wanted something plain and simple. I don’t think it exists though. Everything in JoAnn Fabrics seems to have a feminine touch to it. I get it though. It’s the same if you walk into Home Depot and look at power tools. 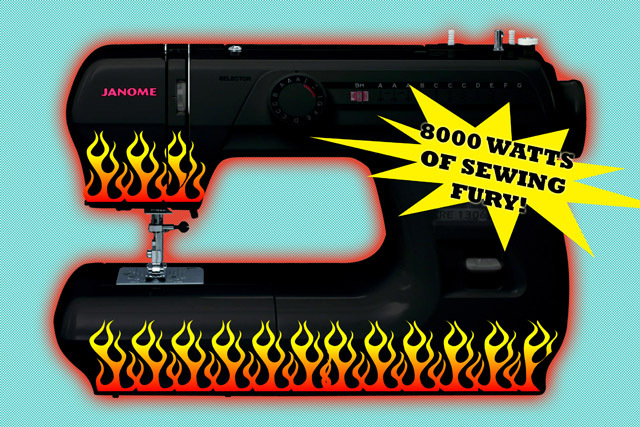 Just as I won’t find a black sewing machine with flames on it at JoAnn’s, a woman won’t find a lavender colored circular saw with flowers on it at Home Depot. It’s just the way it is. Stereotypes can be very limiting if we let them. But I’m determined to not let them deter me from further developing my simple interest in sewing. Other than complaining about their husbands, the women in class always preached how this class was their therapy and a creative outlet. No matter how much they ranted about their families or husbands, I couldn’t help but notice that they spent their “me time” hemming their husband’s pants or making dresses and pillow cases for their grandchildren. They really didn’t hate their families, this truly was their space to vent and relax. It was their night out. I respected that. And because of that, I thought this class was a safe zone for creative freedom and understanding. 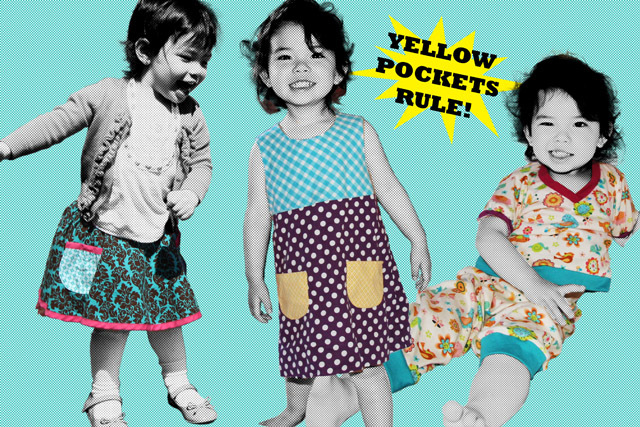 But why did I get so much heat when I wanted to put yellow pockets on a purple dress? Why did the teacher put it to the class for a vote to get me to change my mind? Why did I always get funny looks for my fabric choices? I didn’t say anything about the pillow case you were making for your dog. I want creative freedom too! So, with it all said and done, would I do it again? Well, yes and no. Kelly and I did learn some things. Other than learning how the machine works and some basics, I learned how to install a zipper, and Kelly learned how to do button holes. It was nice to get out of the house and to have another creative outlet too. However, I don’t think either of us enjoyed the dynamics of the classroom. From the mandatory break times, awkward rants, and exclusive conversations, this was clearly a sewing club, not a sewing class. It really can’t be called “Intro to Sewing” when 90% of the class has been taking it for 15 years. It was a cool kids club for these husband hating grandmas and Kelly and I were clearly outsiders. Not wanting to spend money to feel like outcasts, we decided to start our own all-inclusive sewing club for free. It’s called SEW CLUB. You know, like the movie Fight Club. 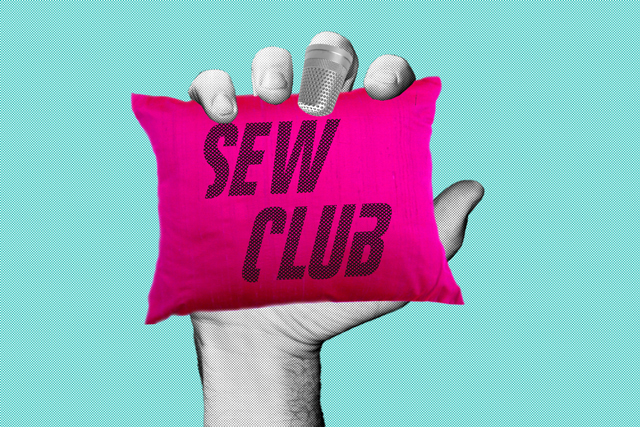 There are eight rules to Sew Club… Actually, there are no rules. Just bring your machine, a project, and your dreams. Sew, if you want to get out of the house and work in a judgment free zone where you can put yellow pockets on a purple dress or make a pillow for your dog without persecution, come on down. My mom has even agreed to show up every now and then to offer real help for people who may need it. Because I can guarantee you, I sure don’t have the skills or experience to offer any help. *SEW CLUB has disbanded because we all got busy, and I moved away. Thats weird about not reading the patterns…..my teacher would yell at us if we asked a question without reading the pattern first…. I have been sewing for eons and I always read the pattern. Although, sometimes I will ask myself, ‘Why are they doing it this way?’ . Maybe someday you will make wedding dresses for your daughters! Thanks – I am so there !! !